Note: This preview includes mid-game spoilers for The Path of Motus. I’ve written about The Path of Motus before, so I was well aware of the game’s anti-bullying themes before I got to go hands-on with it. Despite knowing that the game’s messaging was clearly about how harmful words and actions can be, I found myself in a familiar role. I was using the DualShock 4’s face buttons in order to shoot projectiles (in the form of words) at enemies that were shouting at me. It was an instinctual action, and one of self-preservation since getting hit by any of their attacks would result in the titular character of Motus dying. Now if I had actually put a minute of thought into the game, I probably would’ve noticed that fighting bullying with a more shall we say “justified” form of fighting back was pretty clearly contrary to the game’s themes. Even when the game celebrated the fact that I got through an encounter via mere evasion rather than doing damage, I kept going through the motions of attacking every enemy I’ve seen. After all, this wouldn’t be the first game I’ve played that had a real disconnect between its mechanics and story. Games are often conflictual in nature, oftentimes to the point where they undermine themselves. That wasn’t the case here, though. The conflict was purely with how I, the player, was interacting with the game. At its core, The Path of Motus presents a brilliant lesson: just because you have the tools at your disposal doesn’t mean you have to use them. So, yes, the functionality is there to fight back and to take the lives of others. That doesn’t mean the player has to use them, though. After all, player agency is what makes gaming so unique. By building in completely optional mechanics (ones that could even be described as a red herring) it places so much weight on the player’s restraint, or lack thereof. With some narrative prodding, I eventually figured out that the game wanted me to not be a mass-murderer (which is sadly a rare occurrence in gaming). This completely changed how I saw The Path of Motus, and the gameplay went from a sort-of clunky action platformer to being more puzzle-like in nature. No longer was I looking for the best path to eliminate the enemies, but rather searching for a way around my foes and how to get around them without causing any damage. It does a whole 180 on the entire experience, and it’s a far more interesting game because of it. The combat (or avoidance of said conflict) isn’t the only puzzle, though. 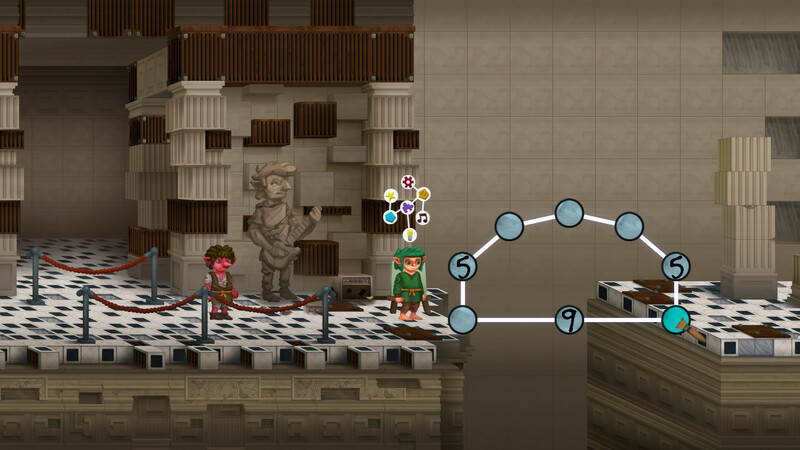 Players also have to solve some awfully devious number puzzles in order to build bridges in-game. For example, a bunch of numbers will appear on-screen, and it’s up to the player to match the quantity with an equal amount of connecting lines. So, if there’s a “4,” I had to connect four lines in total to that one node. It sounds simple in theory, but when you’re trying to balance a screen full of numbers, it quickly becomes quite the challenge. These logic puzzles wind up providing a great change of pace from the more active combat scenarios. They can also be quite frustrating when you’re nearing the precipice of a solution, yet can’t seem to get it just right. There was one particular puzzle where I had all nodes but two successfully connected, and I must’ve spent four minutes just examining the screen trying to figure out what changes I could make that wouldn’t result in losing all of the seemingly correct nodes in the process. It’s an intricate process, and one that I ultimately found really enjoyable. As mentioned previously, The Path of Motus explores the life of an elf that is being bullied. The story takes place throughout three different parts of his life: childhood, adolescence, and adulthood. I saw a good chunk of the game during my demo session, but I was A) Not playing the game correctly at first (shockingly, it’s easier to kill than to be peaceful) and B) Rushing through a lot of the story due to a busy schedule. I was told by the game’s creator that the full game will take a few hours to complete, though. In the second act, I even came across another playable character that happened to be a female elf. While my interactions with the character were minimal, I had to use the two characters intermittently, and use them to deflect attacks so the other character could successfully make progress throughout the level. It’s good to see new mechanics being introduced throughout the game, and I’m interested in seeing what more tricks the game has up its sleeves as it continues. While The Path of Motus might not be the prettiest or most polished PlayStation 4 title, it’s easily one of the most interesting games I saw on the show floor at PAX East. The way it examines the player’s place within a gaming experience is brilliant, and it also has a meaningful message to share as well. It’s set to release later this year on consoles and PC. The Path of Motus preview conducted at PAX East.